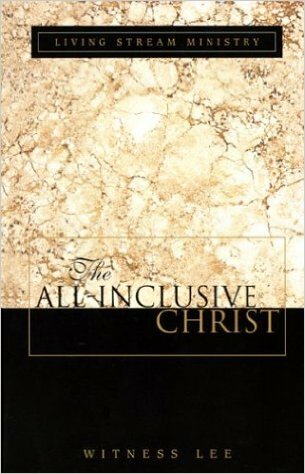 The All Inclusive Christ, by Witness Lee, is a must read for anyone who truly wishes to have a fuller relationship with Our Lord Jesus Christ. This book is both very eye- opening and thought provoking. It takes us on a wonderfully descriptive journey through the New Testament in the style of the good land and links it with the Gospels and the writings of Paul and shows us in depth of the many parts of Christ, and that to truly have a fuller and true relationship with him, we must live and relate to him and all these wonderful parts in every aspect of our lives. Jesus is the very valleys, hills and mountains of our lives. He is our constant refreshment through being the streams, fountains and deep waters of our lives. He is our food upon which we continually feed in him and t+e the food with which we feed all those that we serve. This book gives plenty of examples of the All inclusive Christ in action in every stage of our lives. There is no situation however bad it may be, that cannot be lived with joy if we apply the All inclusive Christ to each and every single part of our lives.